I made falafels for dinner this week so I will take the opportunity to sing their praises. Falafels are often a welcome sight among meat and stodge. They can usually be relied upon to provide something healthy and delicious when choices might otherwise be a pizza or chips or, even worse, a dull salad. I love the falafels served up at a café near work where I occasionally buy lunch. And many a time I have been grateful to see a falafel on offer when confronted by an avenue of food vans at festivals. I have fond memories of eating a lot of falafel during travels in Israel – they were served in pitta bread with cold potato chips (not crisps) and pickled vegetables. There was something particularly exotic about eating them this way because the ‘traditional’ way in Melbourne is with lettuce, tomato, cucumber, hummus and garlic or tahini sauce. It also was a relief to easily find vegetarian food from street vendors. My other memory of falafel is not quite so happy. It is of pushing chickpeas through a sieve in a share house many years ago – it seemed to take forever. It was one of those occasions when it felt like we would never eat dinner for the time it was taking to make it. The falafel recipe I have made most frequently recently is adapted from The Vegetarian Lunchbox by Linda Haynes. It actually calls for a soy puree and lightly cooked cabbage and green capsicums. I use mashed chickpeas and grated carrot. The recipe calls for baking which is less fat but, even with oil spray, just seems to dry them out rather than resulting in the crisp fried shell I associate with falafel. Ideally the best way is to shallow fry and then to put in the oven to crisp up a little more. But some days I can’t be bothered with frying. The recipe is not at all traditional but it is easy and tastes good. I served it with pitta bread (5 minutes in oven - top shelf to crisp up or bottom shelf to be soft) shredded iceberg lettuce, chopped tomatoes, thinly sliced red capsicum and chopped cucumber, plus a yoghurt sauce of plain yoghurt, tahini, garlic, lemon juice and finely chopped parsley. An excellent summer meal, especially when there are leftovers. Crush chickpeas in a medium to large bowl using a fork. Mix remaining ingredients together. I find it easiest to mix with my hands. I think I could have done with a few less breadcrumbs – maybe because I used dry and the recipe actually called for fresh or maybe because I used a few less chickpeas than the recipe called for. That is why I added some water but if you get the balance right you wont need the water. Bake in 200 C oven for 25 minutes – if you have time and energy, shallow fry first and then put in oven for 15-20 minutes. This recipe made 15 falafels. Serve hot with salad and yoghurt or tahini sauce. I made pancakes on the weekend but they were a bit of opportunism and experimentation – you might say they swung both ways (unlike the voters in the Australian federal election on the weekend who seemed to know exactly who they were voting for). The recipe, in Vikki Leng’s Vegetarian Feast, called for cheese, leek and chives to be added to the pancake batter. After the excitement of the polling booth (including numbering the senate candidates from 1-68), I was ready to just grab a copy of the newspaper and head home. At home I regretted not getting leeks but thought I could get away with asparagus and then I thought maybe I could put in the remainder of my blueberries from my salad the previous night. Unfortunately I think the answer is no. The asparagus and blueberry combination didn’t quite work – it was edible but I feel maybe I should have made some asparagus pancakes and some blueberry pancakes. I do feel, however, that there might be an opportunity in the future to do some berry and cheese pancakes. What was particularly pleasing about the recipe was that it offered an option to bake the pancakes as a stack – something I haven’t done before. Again I didn’t have the chives which would have been good. But I had some tomato and cheese and I added Tabasco, thyme and garlic for extra flavour which worked well. Mix flour, eggs and milk til smooth. Add remaining ingredients. Heat a teaspoon of oil in a large frypan. Cook large spoonfuls of the mixture over medium heat til bubbles rise and begin to burst on uncooked side. (Actually bubbles didn’t seem to appear on my uncooked side so I just had to wait til the uncooked mixture thickened a little in the way it does when it is beginning to cook.) Turn the pancake and cook 2 minutes on the other side. Vikki gets 12 pancakes but I only got 9 so mine were probably a bit bigger than she intended. To make the stacks, place one pancake on an oven tray or in a baking dish and top with cheese slices and tomato slices. Sprinkle with garlic, thyme and Tabasco. Top with another pancake and a little grated cheese. Repeat with other pancakes. Bake in oven at 180 C for 12-15 minutes. Three pancake stacked served the two of us. Serve hot with salad. This is my 100th post and I like significant numbers so I wanted to post something cheery and celebratory – birthday cakes seemed perfect. This cake was made for my sister Susie’s surprise birthday party. I was quite pleased with this cake because I couldn’t find a recipe to base it on so, after searching the net for inspiration, I made it up myself. I had to shape the cake a little and make the handle from pipecleaners and ribbon. The decorations are coloured chocolate buttons. Seemed a good idea until we were driving along the Princes Highway to the party on a hot afternoon and the chocolate buttons got soft in the heat and a sign fell off the car window onto the cake – the buttons looked a little less perfectly round after that! This cake is also from the Woman’s Weekly but probably harder to identify as the oven in the book which was white and not so wide. This was chosen by my niece Quin for her ninth birthday and it was suitably bright and cheerful for Quin. I think the most successful part of it was the egg (halved marshmallows and yellow smarties) and sausages (chocolate bullets) in the home made foil frypan. The kids loved the colour and fun of this cake. These were for my nieces, Ella and Grace’s, first birthday. The marshmallow and smarties flowers were from the Women’s Weekly but I think the snowball and jelly snakes octopus (with shark fins cut from liquorice) were from another magazine but I can’t remember its name. This cake was for Maddy’s fourth birthday (from the Women's Weekly). It was chosen by her and went with her fairy dress which she wore to the party. It is a square cake with four smaller squares on each corner and an ice cream cone on each small square. Sounds easy enough but the challenges were trying to have the four small squares even so the cones didn’t sit really wonky angles, and handling ice cream cones covering in icing. 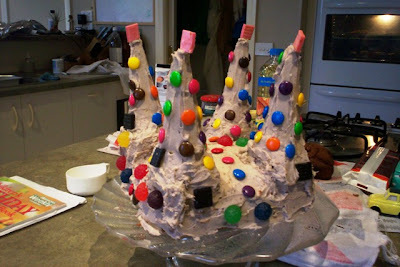 Even more challenging with three small girls helping out but they were very helpful with decorating the icing with smarties and jubes. In the supermarket last week I was asked to try some fresh pineapple by a saleswoman with a little sales counter set up by the zucchini. These people always make me feel awkward because I want to cheer them up with a sale but I don’t really want their goods. On this occasion because I was more tempted by the zucchini than her pineapple, and I felt a little shamefaced about reaching almost behind her for some zucchinis. Maybe it was my awkwardness that made me buy more than I really needed – to show her I do buy generous amounts when I want something! But I digress and am just making excuses for having too many vegetables for my nutloaf I had decided to make. I love my nutloaves and find that adding grated zucchini and carrot makes them lighter and less inclined to be stodgy. This nutloaf is one I love to make with whatever ingredients are about. The recipe below is what I made last week but is fairly flexible, depending on your fancy. Due to having more zucchinis and carrots than usual, I made a large mixture and ended up using two loaf tins, both lined with baking paper – I have had problems in the past with the loaf sticking to the tin. One tin was an old metal tin and the other was a new red silicone tin (courtesy of my mum). I was amazed at the difference in the loaves when they were turned out. The one in the metal tin browned up a lot more than the silicone one – although the one side of the silicone loaf that didn’t have paper lining it seemed to brown quite a lot. Seems like I might need to do a bit more investigation on the differences between silicone and metal tins. I have also added a salad recipe which was inspired by a recipe from the Vegetarian Society for Blackberry, Raspberry and Fennel Salad. But at the supermarket I found it was too late for fennel and too early for raspberries so I improvised with orange and blueberries and what was in the fridge. I added an orange vinaigrette from Vikki Leng’s A Vegetarian Feast. Blueberries look good but can taste a bit bland (possibly this is due to the supermarket berries not being of the best quality) and I would have preferred raspberries or strawberries. Having said that, the green vegies and vinaigrette were fresh and tasty alongside the nutloaf. Grease and line two 22 x 13 cm loaf pans. Preheat oven to 180ºC. Fry onion in oil til translucent. Add garlic and sesame seeds and fry another 3-5 minutes. Place onion mixture into large mixing bowl. Add remaining ingredients and mix well. (NB only add water as needed – my loaves were quite soggy in the middle and made me wonder if I needed quite as much water as I added). Mixture will be quite stiff and should stick together. Spoon into loaf tins and smooth top with the back of a spoon. I baked mine 50 minutes and the outside was done ok but it was a little soggy in the middle. I only served two of us and re-baked the middle part the next night. If you want to serve it all at once you may need to bake it longer. The cooked nutloaves freeze well – you could slice up and then freeze if you only wanted to take out a slice at a time. Serving suggestions: steamed vegies and chutney OR salad and tomato sauce OR roast vegies and gravy (see photos and salad recipe below). Place vegies and fruit in a medium salad bowl. Mix vinaigrette ingredients – I prefer whisking with a small whisk but you might also shake in a screw top jar. Add vinaigrette to salad. Toss and serve. NB: I didn’t have spring onions or chives but I think they would have helped. I would add these to the vegies rather than mixing with the vinaigrette, although you might find you have some vinaigrette leftover, and so want to keep them with the vinaigrette. E and I went along to a family picnic at the zoo for my nieces’ birthdays last weekend. It felt like summer as we sat on rugs on the lawn under the shade of trees to keep out of the hot sun and the flies swarmed to join the picnic. As usual there was an abundance of food: roast chicken, falafel, bread rolls, crudités and dips, asparagus, chocolate cake and fruit. My contribution was to take along some choc chip oatmeal cookies. I’d made cookies the previous day with a recipe from Gwen Steege’s The Search for the Perfect Chocolate Chip Cookie. I’d had a yen to bake for the first time in ages and as usual, the recipes made so many that it felt like we were drowning in cookies. So I took a swag along to the picnic, filled a biscuit barrel and put another swag of them in the freezer. Although, this cookbook is filled with fascinating versions of the classic recipe, I decided to use a fairly plain recipe and resisted temptation to add all sorts of flavourings/textures. They were straightforward, except when they came out of the oven and as usual filled my wire racks to overflowing. I began to move them to make room for the next tray of cookies and burnt my fingers on the molten hot chocolate chips – it had been a while since I baked! After lunch, my family set off to explore the zoo. As someone commented, it was like the army on the move. We saw the restless tiger, the elephants being washed and scrubbed, the butterflies landing on my dad’s hat, the koala climbing the tree, the languid kangaroos and the wombat lying on his back. But my favourite animal is the graceful giraffe. I still am dreaming of the day I get my own pet giraffe – I am sure he would love to nibble on my choc chip cookies! The zoo is full of fascinating facts – the best one we heard was that the cuddly wombat (E’s favourite) has a deadly hard bottom that he uses to squash his enemies. Mix butter, sugars, salt, baking soda, eggs and vanilla. Add oats and flour (she says this makes a stiff dough so I increased the 1⅓ cups flour to 2 cups because it was very soft). Add chocolate chips. Line a baking sheet with baking paper and drop spoonfuls onto it. Bake at 375ºF for 8-14 minutes. I made 72 cookies (but the recipe says it yields 4 dozen). Back in September, E and I had a week in Beechworth which I had meant to write about earlier but it has taken me til now (so forgive me if my memory is a little less than fresh!). Beechworth is a former goldrush town about 3 hours drive north east of Melbourne. It retains a heritage feel and has many fine dining places and gift shops. We had a great break there with lots of much needed good food and rest. We stayed at Kinross Bed and Breakfast (34 Loch St, Beechworth, tel: 03 5728 2351) in the town and would highly recommend it. Our hosts, Terry and Gail were so friendly and it was such a beautiful and relaxing place. Every morning Terry would chat with us and offer us more food for breakfast than we could possibly eat. First up was Gail’s homemade muesli, yoghurt, stewed fruit and a fruit salad. I particularly loved the fruit salad which wasn’t a disappointing slush of melon but was full of apple, banana, strawberries, melons and home grown kiwi fruit. The first morning I ate a hearty bowl of muesli and fruit, assuming that I wouldn’t get a fry up. But Terry and Gail were keen to accommodate a vegetarian with an egg aversion. Each morning E had a fry up with eggs, sausages, bacon, tomato and mushrooms, and I began to feel sorry for him as I had a different breakfast each day – beans on toast, corn fritters and fried vegies, pancakes and maple syrup. I felt well and truly spoilt. And full. Then Terry would offer us fruit toast! The first morning we were so full we could only share a vegetable pastie and a small donut for lunch. After that we tried to leave room for lunch. We had pastry lunches most days, especially given that a few lunch places we were eager to try were closed on the days we went there. But the baked good were fine fare. Beechworth Bakery is well known for its fantastic food and we enjoyed eating there, although a few more vegetarian options would have been welcome. For dinner, the first couple of nights we went to a nearby hotel called the Hibernian. The pub grub was good but what I particularly liked about the place was that it had a vegetable servery by the bar with about 5 different vegetable side dishes that you could serve yourself to eat with your meal. The first time I went I had ravioli with a rich creamy sauce. I was grateful for the vegetable plate on the side with broccoli in tomato sauce, cauliflower in a light cheese sauce, roast vegies, and corn on the cob. I wish more pubs offered such a wealth of side dishes. The second visit I had a spinach, roast pumpkin and roast beetroot salad with a fantastically sharp dressing – again with vegetables on the side. On our last night we had dinner at the Green Shed which had a rustic charm. It was a large room with high ceilings, with the walls painted pale green over bricks with large open fireplaces. The waiter informed us that the building had originally been a printers built in the nineteenth century. On the night we were there, one of the chefs was ill and so quite a few items were off the menu, but it didn’t bother me as most of them were meat. E and I shared a wonderful potato, taleggio cheese and rocket pizza, and a chickpea, orange and yoghurt salad. The crust of the pizza was light and crisp and the flavors were simple and yet different to the usual pizzas and salads on café menus. We also had a rich chocolate rhubarb tart for dessert – I ate the rhubarb off the top and E had the tart! Our final stop on the way home was at the Milawa Cheese Factory, a short drive from Beechworth. Milawa prides itself on being gourmet food country and deservedly so. We bought Blue Cow madras chutney at Milawa Mustards before heading off to the cheese factory. In fact it is a cheese factory, a bakery, a winery, a chocolatier and there was even an art gallery. E had a pie for lunch but I was delighted (to the bemusement of the staff) to have wonderful substantial fruit toast topped by sharp cheddar cheese. I even had to take home a loaf of sourdough bread which was fantastic - I must hunt down where they sell it in Melbourne! We were pleased by the bountiful offerings of Beechworth and its surrounds. Country food has come a long way since I first went vegetarian and was told by a country chef that I was the bane of his life. A fine week of foodie delights! It’s been a long time since I last blogged. Life has been tough and I have not had much energy for food or blogging. But when I start following recipes again, there is hope. So I will ease myself back into my blog with possibly the only recipe I followed over the last few months. I highly recommend it to anyone who wants an easy, challenge-free meal to prepare. It is a variation on a recipe from the Good Weekend Magazine of the Age newspaper (Saturday 20 Oct 2007, p 60) by Terry Durack. I made this recipe again last week. One of the attractions for me is that it is easier than my usual way of making risotto. I usually add the hot water gradually and do a lot of stirring, but this method is just a matter of pouring in the hot water and simmering for 15 minutes. I probably appreciate this even more, having had some headaches (many years ago) in working out how to make risotto without taking hours. Terry Durack says it is like a cross between a soup and a risotto but both times I have found it is much more risotto than soup. I have used pinenuts instead of pancetta, and failed to get either fresh peas or broadbeans, so just used frozen peas – and I added a few more peas and asparagus the second time around. But it was pleasing to be able to find asparagus is now abundant and cheap now that spring has come (and almost gone). Heat the butter and margarine in a large saucepan. Add sliced onion and cook til softened (approx 4-6 mins). Add rice and stir to coat with oil. Add hot stock and simmer for 15 minutes til tender. Stir occasionally. While the rice is simmering, prepare vegetables. Break the woody ends off asparagus and chop into 2-4cm lengths. If you want to add a bit of broccoli (I did because I had some leftover), cut it up finely and add to asparagus. Cook asparagus and broccoli til just tender – I microwaved it on high for 2 minutes. Place pinenuts in a small frypan and heat gently til starting to brown. Stir frequently. When rice is tender, a lot of the water will be absorbed. Add asparagus, peas and broccoli. Cook another 3-4 minutes, stirring frequently to stop rice sticking to bottom of saucepan. Serve with parmesan, pinenuts and parsley (I forgot about parsley when I made it but will try and remember in future).